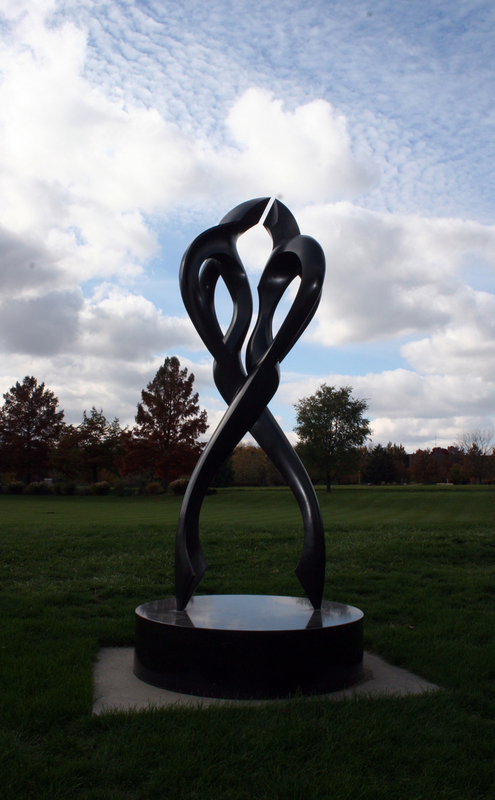 size: 11' x 3'6" x 2'7"
One of the Wandell Sculpture Garden pieces that gained instant popularity with the public was "Tango" by Larry Young. A fund raising effort allowed the district to purchase the piece in 2001 and make it part of the permanent collection. In addition to the purchase of the piece, a plaque dedicating Tango to longtime park district ballroom dance instructor Aurora Villacorta was placed on site. An anonymous donor and one-time member of her dance class helped organize former dance students of Villacorta's and encouraged many to make a donation to help purchase the sculpture. The donor had loved her course so much that he continued to dance and eventually went on to compete semi-professionally.